Global Summits Organiser, IRN, will be hosting the Latin America and Caribbean Oil & Gas Security 2015 Forum on 17-18 March at the Estelar La Fontana Hotel in Bogota, Colombia. Securing oil and gas assets has become crucial for companies operating in Latin America and the Caribbean, a region that holds a fifth of the world’s oil. The Latin America and Caribbean Oil & Gas Security 2015 Forum will gather senior level security representatives from major oil and gas companies to address those current security concerns affecting their operations in the region. Amongst companies confirmed to attend are: NOV - National Oilwell Varco, Tecpetrol, Schlumberger, Armada Nacional (Colombian Navy), SINOPEC Argentina, Americas Petrogas, Petrex, National Army of Colombia, Petroamazonas, United Nations (UNDP-Colombia), Pluspetrol, Calfrac Well Services Colombia, Petrobras Colombia, Steele CIS, Pacific Rubiales, Thales, Atmos International, Afimac and Palo Alto Networks. The Air Assault Aviation Division of the Colombian Army will open the Forum with a Keynote Address on Day 1. This presentation will be followed by an overview of the terrorism in Latin America and Caribbean, including FARC and ELN’s roles in Colombia; Sendero Luminoso’s activities within the Peruvian region, and the threat posed by The Paraguayan People’s Army. This presentation, led by Schlumberger’s Security Advisor for Latin America, will also address the menace of Narco-terrorism and Islamic extremism, terrorist activities that have been increasingly affecting Latin America’s oil and gas sector in recent years. 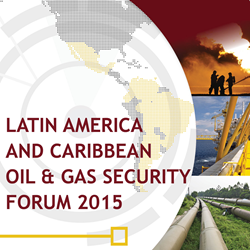 The Latin America and Caribbean Oil & Gas Security 2015 Forum, taking place on 17-18 March in Colombia, is sponsored by Pacific Rubiales, STEELE Corporate Security and Advisory Services, Atmos International, Neosecure, Palo Alto Networks, Afimac, Thales, Oracle, Abloy, Tyco Security Products and Companía Andina de Seguridad Ltda ANDISEG. The Forum is also supported by the Colombian Navy, the Latin American Security Association, the Industrial Cybersecurity Center (CCI), the DNI (Dirección Nacional de Inteligencia) and the Chamber of Commerce of Bogota. IRN is also partnering with charity organisation – Mission 500, a strictly non-profit organization dedicated to serving the needs of children and communities in crisis. More information about this Forum is available on the website: http://www.latamoilgassecurity.com.